Is HP's PalmPad the WebOS Tablet? Is HP’s PalmPad the WebOS Tablet? HP has just filed for a trademark on the name “PalmPad,” signaling their intent to take on the iPad. Since HP debuted their Slate concept earlier this year, we’ve all anxiously awaited an iPad competitor. 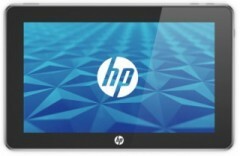 However, with the announcement of the Slate’s cancellation, the HP tablet rumors were iced. When HP acquired Palm, though, the rumors were rekindled in the hope that a WebOS tablet would be in the works. Seems like those rumors ended up being true. While this is just an initial trademark filing for the name, there must be functioning prototypes somewhere in HP’s Palo Alto base. Given that they were easily able to prepare a Slate prototype a few months ago, the hardware is probably already squared away. One of the questions the Slate raised was how well Windows 7 would run on a somewhat-underpowered Slate (running an Atom processor). It seems like the WebOS, developed for the Palm Pre and Pixi, would be a natural choice for the tablet. It’s not as if HP has been coy about this move, though. Since the Palm acquisition, HP has been pretty forward about their desire to have a line of WebOS devices, including tablets, smartphones and even printers. With this move, however, HP brings these devices one step closer to market and brings the fight one step closer to Apple’s doorstep. The PalmPad is still obviously a long way off, but competition is a good thing. It has a tough hill to climb to challenge the iPad, but hopefully an HP entry into the tablet marketplace will liven things up a little more. Read next: Popscreen helps you discover cool videos, then predicts how popular they will become.